A while back, my sweet sister-in-law Claudia was coming for dinner. Oh sure, she was bringing my brother along with her, but when it came to dessert I was really focused on her, because she always serves up a wonderful dessert at her house and I wanted to take care of her the way she takes care of me! I know she loves chocolate…but it was a pretty spring afternoon, and a dark chocolate something…I just wasn’t feeling it. 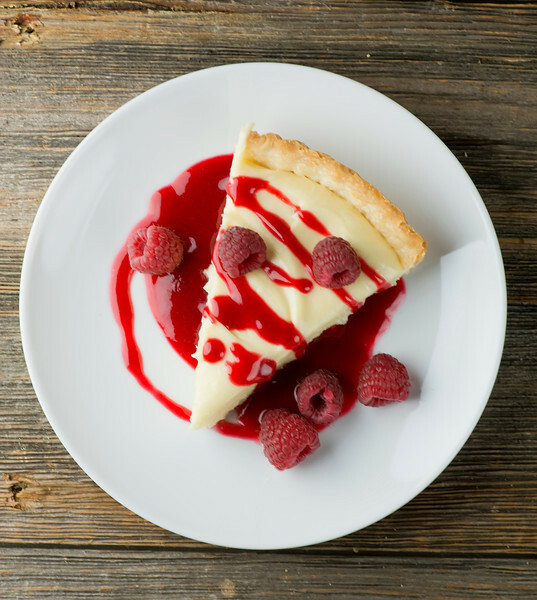 But a scrumptious, easy lemon and white chocolate tart with a raspberry sauce? Yup. I was feeling THAT. And even better, once the pie crust is baked, this requires exactly zero time in the oven. You just mix up the white chocolate with a few other good things, pour it into the pie crust, pop it in the fridge for a few hours and voila! A lovely, lemony treat with a hint of white chocolate. Light and delicious and a snap to make, and if you wanted to dig in just as is, that would be absolutely fine. But! If you want to take this to the next level of wonderfulness, take an extra five minutes to make a quick raspberry sauce that you blend up in your food processor. All you need are thawed raspberries from the freezer section and a little sugar and you are in business…although I did break the bank and buy a little carton of fresh raspberries for garnish. The pie itself is a quick concoction of melted white chocolate, cream cheese and lemon curd (a sweet lemon jam that you can find with the other jams and jellies in your supermarket) that you mix together, pour into a cooked pie shell and refrigerate until it is set. When dessert time rolls around, cut it into wedges and drizzle it with raspberry sauce – and a few fresh raspberries if you are being all fancy. I made mine in one of those tart pans with the removable bottom so there was no drama when I was getting it out the pan and onto the plate. I like this Wilton pan. It’s got the removable bottom and it’s nonstick – extra points! So there you go – my current favorite springtime chocolate meets lemon meets raspberry dessert. Make it for someone YOU love today! Place the piecrust in a pie plate or tart pan, and press the dough up the sides. Prick the bottom a few times with a fork and bake in a 425 degree oven for 15 minutes or until golden. Remove and set aside. Heat 2 cups of water to boiling in a medium pot and remove from heat. Place the chocolate in a bowl that can sit on top of the water in the pot and leave for 3-5 minutes. Now remove bowl from pot and stir the chocolate with a wooden spoon until melted and smooth. Put melted chocolate, cream cheese and lemon curd in a large bowl. Blend with a mixer until smooth, and then spoon into pie crust. Smooth the top and refrigerate until set, about 6 hours or so. Before serving, make raspberry sauce by processing sugar and thawed raspberries until smooth. Strain the sauce through a fine mesh strainer (stirring to help the sauce through the strainer). 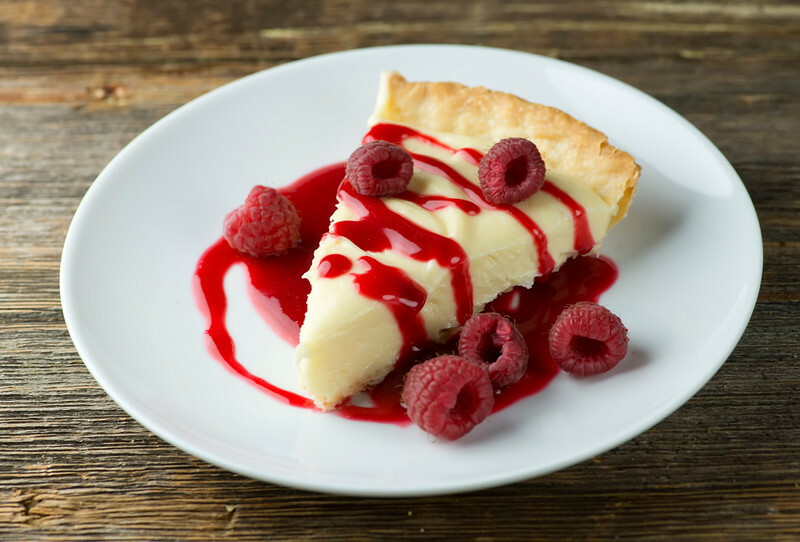 Cut the tart into wedges and serve with sauce and a few raspberries for garnish. This looks beautiful and great for a summertime refreshing dessert, Kate! ..and you let your brother have some?;-)! Sounds delicious! Can’t wait to try it!! Question – how much lemon curd is required? This really looks Yummy and very easy to make. I even have a tart pan that was only used once so this will give me a great opportunity to dig out my pan once again. That sauce would even be good drizzled over ice cream as well. Thanks 4 the recipe. I know I will be making this soon. Ooooh, key lime pie with raspberries! I know one Southern husband who would LOVE that! Girl, you are dressed to impress with this pie in tow! Color me hypnotized. This recipe is so easy to make and sooooooo good! The raspberry sauce is a must!! Thanks Kate for another great recipe! I made this tart for Christmas. maybe it is different depending on the lemon curd you use, but it was too sweet. I never thought I could find some that was too sweet to eat, but this was it. Hi Cyndi! I’m sorry this one didn’t work out for you! And yes, you are right about piecrusts – they definitely do shrink in a little as they bake. Thanks for your feedback, and Happy New Year to you and yours!